I’m So Happy, it’s Absolutely Filthy! This is the first of two of blogs following the treatment of an object for the new Cast Court Interpretation Gallery, which will be opening to the public on the 1 December. This object, Repro 1868D-138, is one of four copies of the Milton Shield, and the original is currently on display in Gallery 122 in the British Galleries. This object is possibly one of the most copied objects made in the 19th century, and for more information about the original please see here. 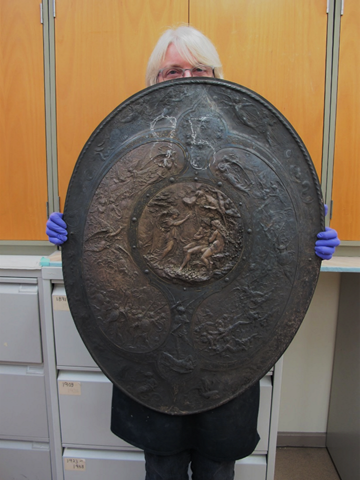 Donna with the shield prior to conservation. 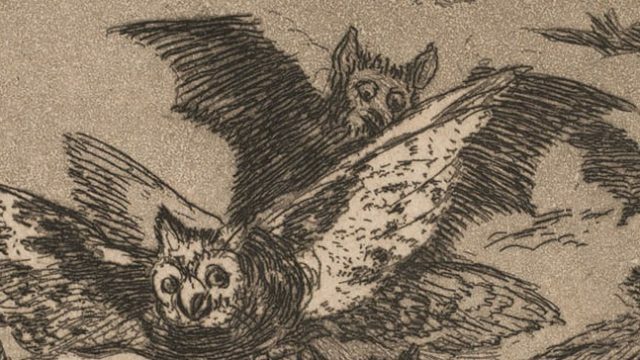 This copy was bought by the museum in 1868, and from its condition it appears to have languished in the deepest darkest museum store ever since. Usually the objects I get to work on in Metalwork Conservation are slightly less dusty and tarnished, and don’t look too much different in the before and after photos. However this object is going to change completely, and, from a conservation point of view, it’s going to be a very interesting project. The shield in pieces prior to conservation. 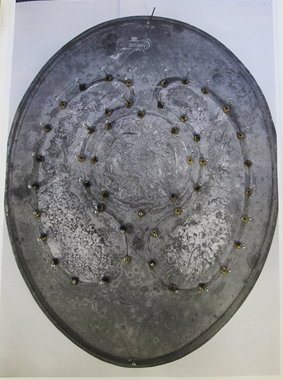 The shield is made of four sections all held together with nuts that screw on to threads soldered to the back of the main body of the shield. As a rule of thumb, when treating objects that are held together like this it is advisable, if possible, to disassemble an object. Not only is it easier to work with smaller parts it also means you can clean and remove any corrosion that may be lurking in the joints. 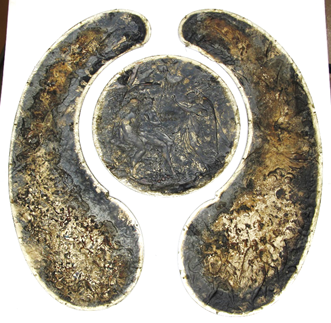 The photo above shows the central plaque and two lobes from the reverse. The bright edge shows where they were in contact with the main part of the shield and protected from the air and tarnishing. 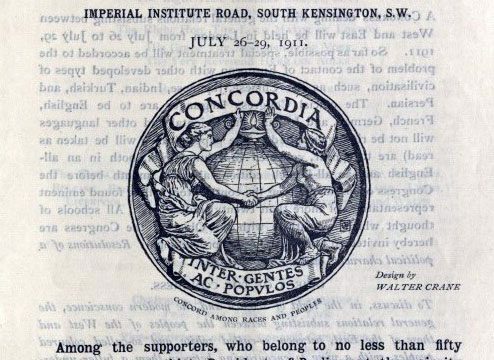 As the shield was manufactured in the mid 19th century; the screw threads and nuts are all machine made and so should all be interchangeable, however, to make sure, each nut goes back on to its original thread we printed a photo of the back of the shield, stuck it onto a piece of ‘Plastazote’ foam, and then used a pin to keep each nut in its place. When all the parts have been cleaned, along with the cleaned nuts, the shield can be re-assembled. Next week a second post will reveal the shield once cleaned, and ready to be put on display.